NOW: Obscure Holidays – Next Hipster Trend is what's HAWT, NEXT! How did we miss Fairy Day?! Alright, everyone’s heard of the biggies: Christmas, Easter, Thanksgiving, Independence Day (hey, if you’re not Christian or American it’s not my problem) … but what about the little-ies: Beautician’s Day, Chocolate Pudding Day, and Canoe Day? What if I told you that all three were TODAY?! Well they are and that means you’re already behind. That is unless like me, you’re presently canoeing whilst liberally applying a chocolate pudding-based facial mask to your friend Theo in homage to the beautician profession (textbook multi-trending). As you should know by now, a lot of what we hipsters do is for one reason alone … we want people to notice us and ask us questions so we can tell them all about how whatever it is we are doing is important or interesting. Now with any luck they will never have heard of it before, and if they have that’s cool too, because odds are that the WAY we are doing it is different than your average normal or even low-level hipster. Case in point: obscure holidays. This whole arena is crazy-ripe for hipster picking. From just a couple of minutes of random perusal of daysoftheyear.com I can confirm obscure holidays are a veritable treasure trove for the hip. 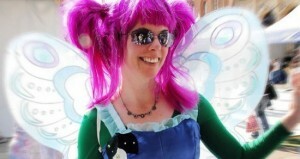 I mean, this Tuesday was “Fairy Day.” Why the hell didn’t I think of this sooner. I could have showed up to the marketing meeting wearing green tights, pink hair, and coiled-toed fairy slippers. Imagine the dumbfounded reactions of my co-workers? “Whaa, what the hell are you wearing Kory?” “Oh this? It’s Fairy Day. Are you just wearing normal business-casual to be ironic?” Their jaws would have been on the floor. So, we missed that one but it’s okay. Looking ahead there’s some excellent advantages to wow them in the month of July alone, including but not limited to: Cow Appreciation Day, Teddy Bear Picnic Day, Don’t Step on a Bee Day, Embrace Your Geekiness Day, Pandemonium Day, Tapioca Pudding Day, Yellow Pig Day, Uncommon Instrument Awareness Day, Lumberjack Day, Thread The Needle Day, Talk In An Elevator Day. Dang, we’re already doing most of this stuff, we just need to do it with more gusto on the assigned days! Whatever you do don’t celebrate the “holidays” of the normals like the lame upcoming staple “Independence Day.” Use it as an opportunity to advance your cause, which in this case is vegetarianism (or better yet veganism). This is a great chance to host one of your classic dinner parties (see: Coconut Oil, Tiny Food, Pico-Brewing). Invite some friends over for an “Independence Day Party.” They will undoubtedly arrive in patriotic attire, probably trying to be ironic and spouting off faux-jubilant “‘Mericas,” guess what? Wrong. Great them at the door with flyers showing the plight of all things livestock … cramped chicken silos, sickly cattle, sad-faced baby lambs tied to a tree. Awesome. “Oh, you guys thought I meant Independence Day as in fireworks and bratwurst?? No, today is Meat Independence Day,” you can dryly deliver. If they are anything like you (which they should be, because they are hipsters) they will quickly roll with it and profess their love of tofu and watercress. From there you can wax poetic for hours about animal rights and “the disconnect between humanity and mother earth.” Great stuff. Get on this one right away, you don’t want to miss Hug Your Cat Day. Follow my lead here and you’re ascendancy to the upper echelon of the hip is as sure as tomorrow is Sunglasses Day.